Have you ever wished that you could just get a virtual assistant to manage your money for you, but still keeping you completely in the loop? Say hello to Trim – the company whose mission it is to solve your financial problems so that you can live the life you want. Often, when it comes to getting started with tackling your finances – whether that be creating a budget, building an emergency fund, paying off debt – it can be difficult to know where exactly to begin. You can also save money easily with services like Ebates for cash back or Ibotta. Is Trim Simple Savings Account Free? 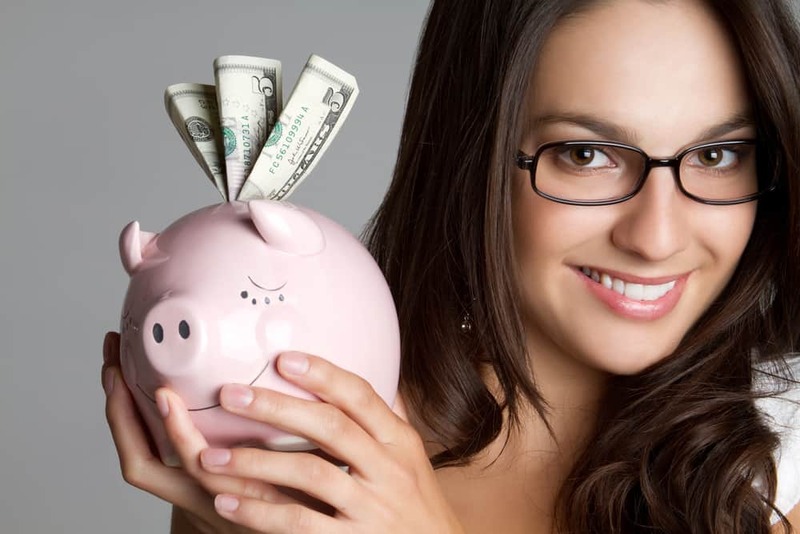 Can I Use The Trim Simple Savings Account On Its Own? Trim isn’t an app, but it is an AI (artificial intelligence) assistant that will look at all of your financial transaction commitments and see if there is a way that you can save money. It was founded in 2015 by Daniel Petkevich and Thomas Smyth – and they say that they started with the idea of tackling spending problems. When it comes to services that are paid for via direct debit, and automatically renew when the initial time period has lapsed – it can be really easy to forget to cancel your subscriptions. This is what Trim set out to help within the beginning. As they started to grow, they then began tackling other problems, such as getting out of debt, saving money, if you have enough money to retire, and so on. They have helped Americans save over $20 million so far through using their service! 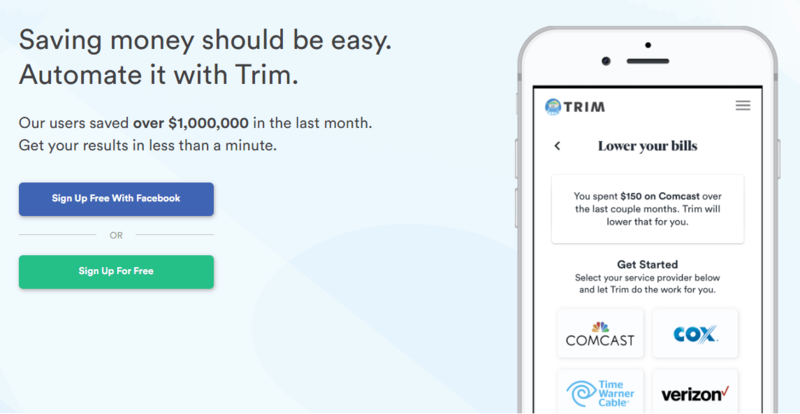 You can sign up for Trim right now and get your piece of that savvy savings pie. There are a lot of good points about using Trim, but it’s always worth looking at the pros and cons and weighing them up. They will cancel unwanted subscriptions for you, which saves a lot of time and hassle. They will negotiate your bills for you, if they can see that you are paying too much, to save you money each month. It’s easy to cancel or negotiate, as it’s all done via messenger or text – you just have to confirm that you are happy for them to go ahead and take action on it. They will take a commission (33%) when negotiating your bills – if you did it yourself, it would of course be free. Once you have signed up and linked your bank account to Trim, it will look at what you are signed up for, and check if you can save any money. It’s essentially a virtual assistant who looks at the money that you are spending and sees if you can do any better – without any extra work on your part. Trim will look at the things that you are signed up for and see if they can make you any savings. Are there things that you have signed up to and are paying too much for, or not using at all? Trim will let you know. I spoke to someone recently who admitted that they had 5 gym memberships that they had signed up to and were paying for – but they weren’t actually going to the gym at all. This is a good example (although perhaps not the most common!) of signing up for things and forgetting to cancel them! Trim does this by noticing recurring subscriptions to make sure that there is nothing there that you have forgotten about, or do not want to use anymore. This is one of those tasks that a lot of us want to get round to, but don’t find the time to do it. Trim will send you a message asking if you would like to go ahead – so you get to confirm whether you want them to take action it or not. One of the best features that Trim offers is bill negotiation. This is something that can be great to use if you don’t have much time on your hands, or perhaps you don’t want to get into negotiations with a company (is it just me who hates talking on the phone?!). You are usually tied into certain things for a set amount of time e.g. with your electricity supplier for 2 years. When it comes to the end of the 2 years, they will usually automatically enroll you into a new, higher contract. This is something that happens to the best of us. You keep telling yourself that you will get round to it, but the time rushes away from you and it doesn’t get done. Trim is able to look and see if you are paying too much, and do some bill negotiating on your behalf to reduce your bills. This is where Trim makes its money, however – by taking part of the savings that it finds for you for their commission (just something to keep in mind). Have you heard of Trim Debt Payoff? This is a great feature that they offer because it’s your way of getting a professional financial coach to look at your finances, for a much cheaper rate than you would usually pay. The financial coach will analyze your finances, and provide you with advice on how you can improve your situation. There is no specific fee for this service, but you will be asked to pay what Trim deem a fair fee between $3 to $10 a month. You can sign up here. You will need your email address or Facebook login to sign up. Once you have signed up, you will be asked to connect your Facebook account or phone number, because Trim sends you messages via Facebook Messenger or text. The next step will be to connect your bank account and/or your credit card, so that you can get started with using Trim. Get your Trim login, and get started saving money today! It is free to sign up for Trim, and also to use it, get alerts and messages, etc. and so on. When it comes to negotiating your bills, however, Trim will take a portion for compensation for contacting the companies for you to cancel the direct debits. For example, if your cable bill is $100 per month, and then after using Trim it has been negotiated down to $70 per month, the amount that you will have saved each month will be $30 per month ($360 a year). The commission that Trim will take is 33% – so 33% of $360 is $118.80, which means your savings per year will be $360 – $118.80 = $241.20. It’s only natural to be a bit hesitant about your security when it comes to using services for your money online, but the companies know that, and do their best to keep things secure. In fact, on the Trim website under the Security section, they explain that when it was founded, it was initially tested out with their own banking, and then their family and friends – so it was in their best interest to keep it as secure as possible. They use Plaid to securely connect to financial institutions across the country. When you register, you will provide your banking details, but these never go on to the Trim servers nor are they stored at all. They use 256-bit SSL encryption for the website and databases. Servers are hosted with Amazon Web Services, who are used by NASA, the Department of Defence, and the Financial Industry Regulatory Authority. Have you heard of Trim Simple Savings? It’s an automated savings account through Trim, where you can earn 1.5% interest annually on your balance. You can set up weekly transfers of whatever amount you would like, and this will come out of your account automatically. The savings account isn’t free, but for a small fee of $2 per month you will get access and it will unlock automated weekly transfers, and come with an annual reward of 1.5%. If you are wondering if you can set up the savings account as a standalone savings account, unfortunately, this is not the case. In order to be able to access the Simple Savings account, you will need to have a Trim account. If you are someone who finds it hard to find the time to tackle their finances, this can be a life-saver for you. There is nothing worse than paying for something that you are not using – or paying a higher price for something when you could be paying much less for the same service. Has going through all of your bills and statements been on your to-do list for ages, only for you to find the time slipping by and the charges continually increasing? This is where Trim will save you a lot of time and worry by doing the hard work for you. If however, you are laser-focused on getting on top of your finances, it may be worth keeping hold of your money and putting the hard work in yourself to speak to your service providers and get your services canceled or reduced. Choose whichever way works best for you, as long as you are trying to save money. In our opinion, Trim is a great way to save yourself money if you are short on time – but you can always try and negotiate yourself too. Sign up for your free Trim account now and start saving money in no time. Have you ever heard of Trim before reading this review?